Delaware North Chefs at James Beard Event. I am busy catching planes and jumping in-and-out of kitchens, so I only have time for a quick post. I wanted to take some time to tell you about how Delaware North’s chefs took part in the recent James Beard Foundation event. 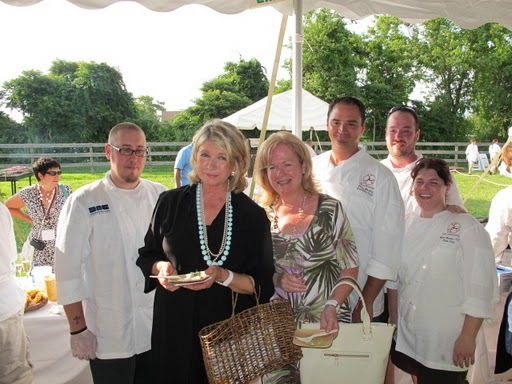 Delaware North chefs with Martha Stewart. For those who don’t know much about James Beard, he was a pioneer in the culinary world who changed our profession and the way we eat. He passed away in 1985 but his legacy and lessons live on through his foundation. It is one of the most respected culinary organizations in the world and it is an absolute honor to be selected to cook, prepare food or even wash dishes at one of the Foundation’s premier events. I am very proud to say that our Chef from The Ahwahnee in Yosemite National Park Percy Whatley and his Sous Chef John Adams, along with Sous Chefs Beth Brown and Jeff Wheaton from New Meadowlands Stadium, recently took part in the Foundation’s annual summer gala in the Hamptons called Chefs & Champagne. They were four of just 30 chefs from across the country to take part. They should be very proud of their work. I have not had much time to speak with them since the event, but fortunately Martha Stewart attended and blogged about it. You can read what she thought of the event and see photos at this link. Alright, I need to keep moving. I will blog again soon. This entry was posted on Friday, August 20th, 2010 at 11:09 am and is filed under Uncategorized. You can follow any responses to this entry through the RSS 2.0 feed. You can leave a response, or trackback from your own site. One Response to Delaware North Chefs at James Beard Event.